Happy Kitchen Sink Stamps Monday! 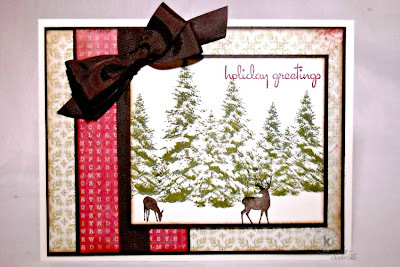 I just love the scenes that you can create with the Multi Step Snowy Pines and Multi Step Tree Friends stamp sets. Here, I added the deer after stamping a grouping of pine trees, then finished with a sentiment from Ready 4 Any Holiday, to create a Christmas card. I started out by stamping the larger grouping of Snowy Pine trees in shades of Green, then stamped the smaller grouping on each side. To complete the scene, I stamped the deer from the Multi Step Tree Friends stamp set in Chocolate ink, and the sentiment in Cherry Cobbler. OH! This is so pretty. looks like a photo, this is so very pretty!